Please use the interactive map to find directions to Big Creek RV Park! According to Wikipedia, a “shut-in” is “a narrow channel because of hard rock and is unnavigable.” Johnson's Shut-Ins is on the Black River, which weaves its way through the shut-ins, splashing and churning in a spectacular way. The rock creates a natural waterslide in some areas. This is the most visited state park in the state of Missouri, and the fifth most visited state park in the United States. 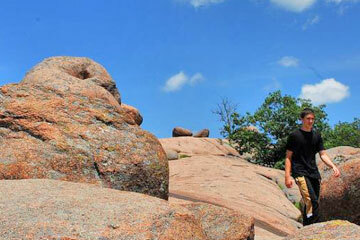 Huge, granite boulders as large as elephants are what give this spectacular park its name. These boulders sit atop a hill, just like circus elephants. The largest rock, Dumbo, weighs 680 tons. It is 27 feet tall, 35 feet long, and 17 feet wide. This is a must-see on your trip, perfect for hiking and photography. Taum Sauk Mountain, at 1,772 feet, is the highest point in Missouri. Hike the 3-mile loop (1.5 miles each way) to Mina Sauk Falls, the highest wet-weather falls in Missouri. The water cascades over 132 feet of igneous rock ledges, with a wonderful view of the St. Francois Mountains from the top of the falls. There is a wonderful Native American legend about Mina Sauk Falls and how it got its name. Or climb the fire tower and get a breathtaking view of the area below. A mile down the Taum Sauk section of the Ozark Trail is the Devil’s Tollgate, an 8-foot-wide passage of volcanic ryolite. The passage stretches 50 feet long and 30 feet high on both sides. The Battle of Pilot Knob, waged on Sept. 26th and 27th, 1864, was one of the largest battles fought in Missouri. It was key in the failure of Gen. Sterling Price's raid on the state of Missouri. Today, the walls, the moat, and the gun platform of the fort are still intact, as well as the crater left by the explosion of the powder magazine. Fort Davidson is at the center of what remains of the battlefield, and it reminds us of the sacrifices made by Missouri's citizens during the Civil War. It was placed on the National Register of Historic Places in 1970. There is also a Civil War History Museum at the site. The Black River forms near Pilot Knob in the Mark Twain National Forest of Iron County, then flows southward through Reynolds, Wayne and Butler Counties into Arkansas to its confluence with the Current River at Pocahontas. Its headwaters begin just a short distance north of Taum Sauk Mountain, the highest point of elevation in the State of Missouri, and flows through Johnson's Shut-ins State Park above Lesterville down through Clearwater Lake and Poplar Bluff before entering Arkansas’ far northeast corner. Since about 1720, lead has been big business in the eastern Ozarks. 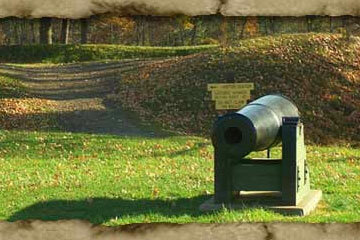 There’s no better place to explore that history than at Missouri Mines State Historic Site. There you can see the processing plant of the former St. Joe Lead Company, which has been turned into a museum. The museum displays actual machinery from the mines, interprets the area’s lead mining history, and houses one of the Midwests’s finest collections of minerals. Millstream Gardens Conservation Area, off State Hwy. 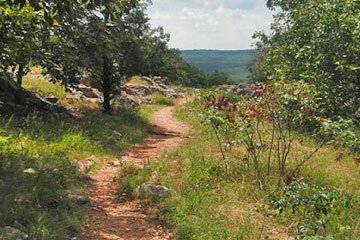 72, is a 697-acre tract of land that showcases all the beauty the Ozark mountain area has to offer. The St. Francis River forms one of its western boundaries, which then meanders eastward for 1.2 miles through its mid-southern section, before rushing through the Tiemann Shut-Ins and passing into the Silver Mines area. 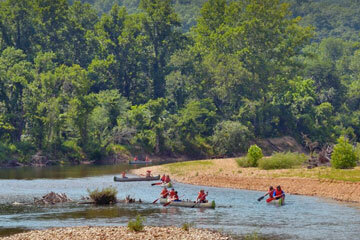 This park, at 8,238 acres, is Missouri’s third largest state park. There are about 2,000 acres set aside for the ORV (off-road vehicle) riding area. Special rules and regulations apply, so contact the park office at (573) 431-1069 for information or visit their website. This scenic park is right in the middle of southeast Missouri’s old “Lead Belt,” where lead ore was extracted to supply much of the nation for more than a century. The land for the park was donated by the St. Joe Minerals Corporation in 1972 when it ceased operations. In addition to the ORV riding, there are hiking & biking and equestrian trails, picnic sites, and a lake for swimming and fishing. The mill buildings still stand and have become the Missouri Mines State Historic Site. 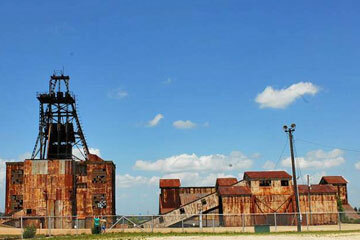 This includes a museum with antique mining and milling equipment and a large collection of geological samples. 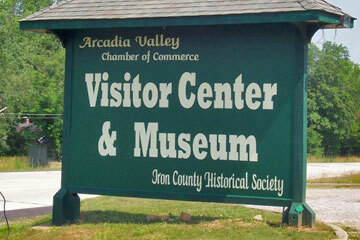 The Iron County Historical Society was founded in 1974, with a mission to “preserve and share the rich history of Iron County, Missouri.” You can find the Iron County Historical Society and their museum in the Whistle Junction Visitor Center in Arcadia, MO. This building is the former Missouri Pacific Railroad station and was constructed in 1941 using red granite from the nearby Sheahan quarry in Graniteville. 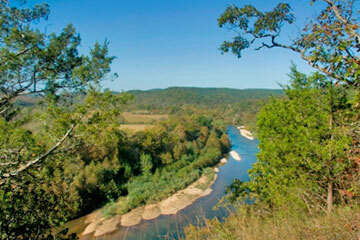 The beautiful Ozarks serve as a setting to Mark Twain National Forest. There are a wide variety of activities available, including trails for hiking, biking, and horseback riding. 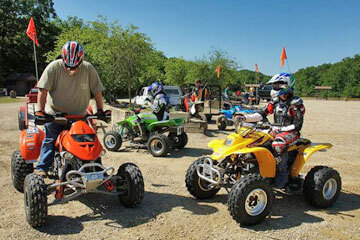 ATV riding is permitted in certain areas with a National Forest permit. 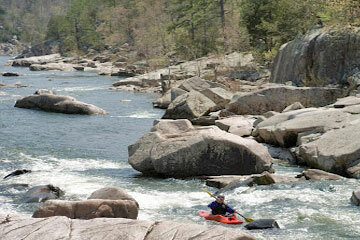 You will want to check out the Taum Sauk and Marble Creek sections of the Ozark Trail. For detailed trail maps, click here. 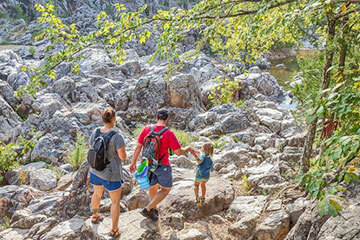 Click here for a great trip planner to plan your hike! Be sure to take your camera, because there are ample opportunities for both amateur and professional photographers and birdwatchers alike. The Black River is the perfect place for both floating and fishing. We recommend Jeff’s Canoe Rentals in Annapolis (a quick 7 miles from the RV Park) or for all your floating needs.​ Prefer to float out of Lesterville? Bob & Bob at Franklin Floats will take great care of you. Want lake fishing? Clearwater Lake is 25 minutes away, and is great for fishing, swimming or water-skiing. Find the fishing report and other info at clearwaterlake.org. Council Bluff Lake is another lovely place to go for swimming, fishing, or other water activities. Click here for more information. You can’t beat horseback riding beside the beautiful clear Black River! Black River Traditions is only seven miles from Big Creek RV Park and has something for everyone! Prefer to bring your own horse? They have overnight boarding as well. Click here to check out their trail ride packages and other options. Arcadia Valley Stables in the scenic Arcadia Valley will take you riding along Stout's Creek, and will even provide a picnic lunch. Click here for more information on this fun-filled family outing. Love treasure hunting? Geocaching is a real-world treasure hunt, using your handheld GPS or smart phone! There are several geocaches in the surrounding area. Click here to start your geocaching adventure! Take a scenic drive along the Ste. Genevieve Wine Trail! The six wineries and vineyards in Ste. Genevieve County will give you unique glimpses into both the growing of grapes and the making of wine. You will have the opportunity to enjoy breathtaking scenery as you tour their tasting rooms, browse their gift shops, and savor the wonderful wines of this region. Visit Route Du Vin Wine Trail for more information. © Big Creek RV Park. All rights reserved.